A confusing array of snapshots of women from the history of the Western hemisphere. Morales (who has taught Jewish studies and women’s studies at the Univ. of Calif., Berkeley) wants to make the point that Puerto Rican women descend from many diverse cultures, and so she rightly includes stories here from West Africa, various parts of Mexico, and even Native American tribes, as well as Spain. But some of the inclusions really stretch the imagination (Ethel Rosenberg as an ancestress of Puerto Rican women?). 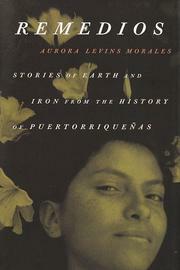 Also, Morales includes very little about contemporary Puerto Rican women themselves, except to tell us in the introduction that they “have always held up four-fifths of the sky.” The entire book is a chronological leap through 200,000 years of cross-cultural women’s history. It is imaginatively organized, however, beginning with bisabuelas (great-grandmothers) and ending with the author’s birth in 1954. Morales incorporates sidebars on assorted healing herbs and plants (shades of Like Water for Chocolate) into this ostensible healing history. Some of the profiles are illuminating and fresh. We learn of the many women in conquistador Hern†n CortÇs’s life, including his ill-fated first wife, whom he probably killed, his well-connected second wife, and his captured mistress. Another vignette examines Sister Juana de Asbaje, who in 1693 wrote “the first feminist essay published in the Americas.” In the 1820s, French-Peruvian noblewoman Flora Tristan was similarly inspired by feminism, embracing socialism and traveling the world. Despite these standouts, Morales’s impressionistic glances at various women lack cohesiveness. She also tends to romanticize their contributions: St. Teresa of Avila, who cursed herself for being born a woman, is here lauded for her courageous, mystical feminism. The reality of Teresa’s life was far more complicated. Intriguing tidbits throughout make the book worth reading, but the parts are stronger than the whole.